Grace is a picky eater and rarely tries new foods. A few weeks ago, she surprised us by wanting to try a few new things. 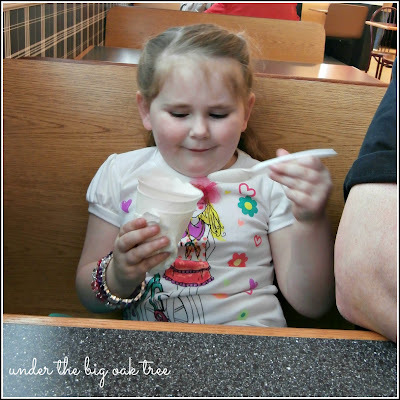 Most of her new choices were junk food, but we still encouraged her since she's been getting bored with the handful of foods that she does like. Ice cream was one of the foods she wanted to try and that was only because she saw a commercial for a new gadget where kids can make their own single serving size of ice cream! Honestly, I didn't even realize the commercial made any sort of impression on her. Normally, she's very vocal about letting us know what items she would like us to buy her when she sees them on TV. She never even made a peep about the ice cream shaker. On a day out at the mall with my Mom, Grace suckered me into getting the ice cream maker. It was $9.99 and I had a gift card in my wallet that I was wanting to use. We made the ice cream after dinner and Grace loved it! 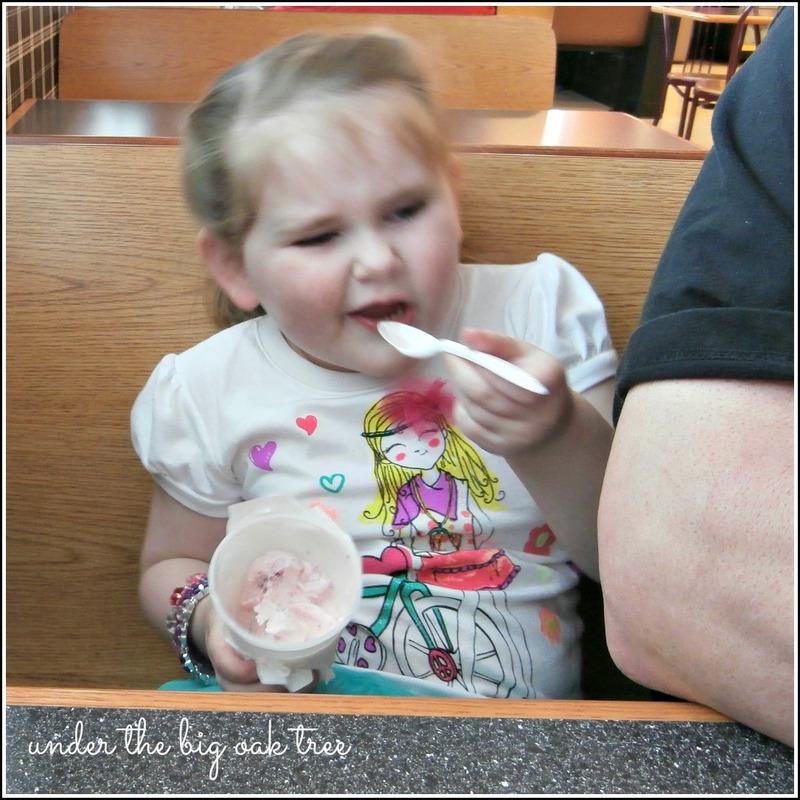 Just yesterday, while running errands, Grace requested pink ice cream. This, again, was something new as she has only tried vanilla when we made it at home. Since we were out, we stopped by one of the local farms that also has an ice cream parlor. I was shocked when Grace recognized the farm as the pumpkin patch we went to in October! I ordered Grace a kiddie cup of strawberry since she was still insisting on pink ice cream, but I worried that she wouldn't like the strawberry chunks. She looked like such a big girl carrying her cup over to a table. She took very small bites at first. I thought maybe she wasn't pleased with her choice, but then Joe realized the texture of the hand-dipped ice cream was different than the less solid ice cream we made at home. He stirred it up for her a bit and made it more like the ice cream she was used to. This resulted in bigger spoonfuls and some pink ice cream on her white leggings! Also, just as I suspected, Grace did not like the frozen strawberries in her ice cream! She spit it right out, said it was yucky and wiped her tongue on her arm! (The camera was already in my bag, so I didn't get a picture.) 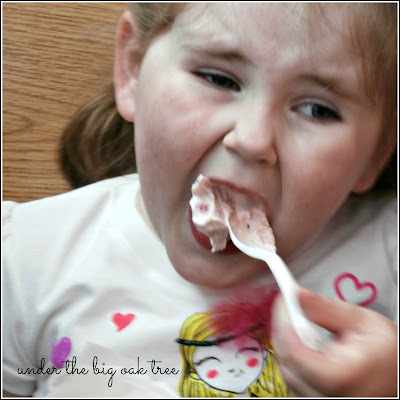 We'll have to try pink sherbet the next time, since I don't think she will want to eat the strawberry again! As we were leaving, Grace spotted some picnic tables outside and requested that we have an ice cream picnic the next time we go out for ice cream!